Well, half of it anyway: the 2iC in his Cromwell and two Crusader AA tanks which, even if I never use them, I simply had to paint. They are modelled on ‘B’ Squadron, 1st Battalion, Royal Tank Regiment, one of my favourite units of the British Army during the Second World War. Click for larger versions. 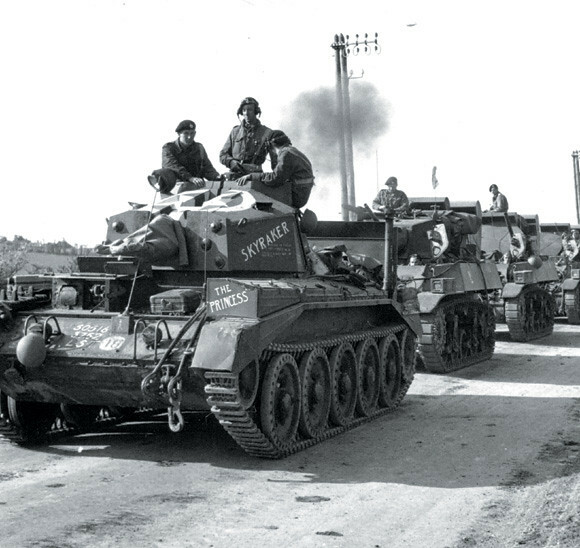 The Crusader AA tanks are attached from HQ Squadron, hence the diamond squadron markings, and based loosely on pictures of the original vehicles (below). 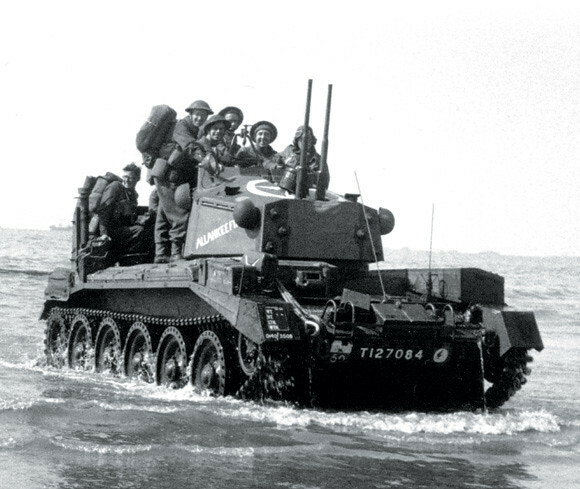 Also, as this is based on 1 RTR in Normandy, the Regiment was the Senior Regiment of the 22nd Armoured Brigade; hence the red squadron markings and 51 with the 22nd’s distinctive Stag head Brigade sign paired with the Jeroba of the 7th Armoured Division. I’ve applied most of the “theoretical” markings: in reality the 7th Armoured seldom applied them all (or even a few) until 1945. Decals by Dom’s Decals: I pestered him for quite a while for the combined 51/Stag head decals and they are very well done, so thanks Dom. He has even done a set of tank names which includes those of ‘B’ Squadron, 1 RTR, so I don’t have to hand-paint them. I tried to apply the Allied Stars on the upper decks and turrets but this resulted in a complete mess (especially on the AA tanks) so I abandoned the attempt. The green is Mike Starmer’s recommendation for British SCC15 green, a 50/50 mix of VMC 888 Olive Grey and 924 Russian Uniform, and it is definitely “greener” than straight 924 which was simply wrong to my mind. For comparison, the barrel on the back deck of “Allahkeefik” is 924, completely lacking the green and here appearing very drab by contrast. Out of 20-something vehicles in the Squadron I’ve only managed to finish six so far, this half of the HQ and the Stuart Recce Troop. 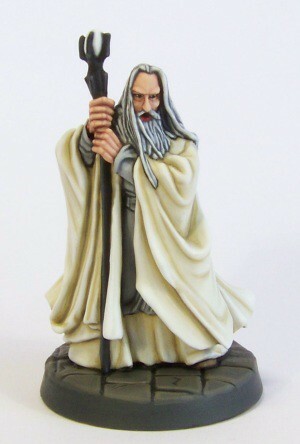 Painted these two largely as an exercise in painting white and black: Saruman the White (but not too white) and Grima Wormatongue, both from the GW Lord of the Rings range. The white was a chance to use the P3 Shades. I started with a base of Hammerfall Khaki for the darkest shadows, then added Menoth White Base until painting pure MW Base, then into Menoth White Highlight, etc., and finally Morrow White. In the past I have always had trouble painting with Vallejo white, but the P3 shades are simply awesome. 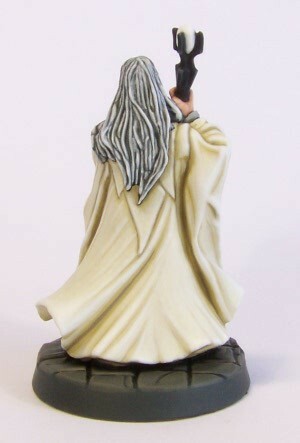 I also like the less-than-pure white effect here: as Saruman had turned to evil, it makes more sense to me. I went for a very “soft” approach, applying multiple layers of thinned paint from one colour to the next, intermixing as I went. Very time consuming, and not something I will do on rank and file gaming pieces, but something I have wanted to try for a while now. I’m pretty happy with the cloth overall, though there are places where the shadows could be softer: something I need to work on. The main part I don’t like on the figure is the hair: it’s just too strong a contrast for my liking. The face could also do with a bit more definition I think, as is the highlights appear too dark (or rather not enough contrast between layers). 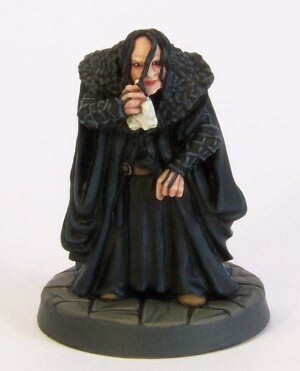 Grima Wormtongue was the candidate for painting black. In the past I have always worked with black followed by dark greys as highlights which always ended up looking like....dark grey. Here I confined the greys to, well, the stringy bits on his arms and the fluffy-looking thing on his shoulders...technical terms these. 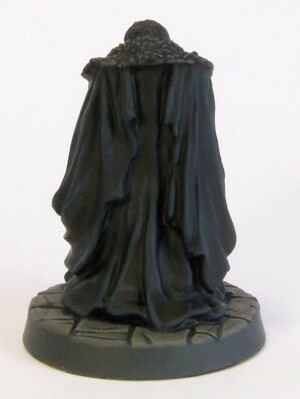 Apart from this the cloth was painted black and only the very edges highlighted with a mixture of P3 Thamar Black and P3 Coal Black, the lightest highlights being Coal Black. This gives the black a blue-ish tinge, but to me was preferable to more dark grey. Dogey pics don’t show this too well though. I kept the face suitably pale and tried to give it a wormy look, a slight reddish was under the eyes, etc. The Grima character in the movies was, for me, one of the better adaptations from Tolkien's work. As always, C&C more than welcome.